The first round of boxing was fairly energetic.It was clear that these are amateur boxers. They leave a lot of openings that I’m sure more skilled athletes would exploit. A lot of punches do land, however, and it does underscore the importance of both of chessboxing’s components. Being repeatedly hit in the head can’t be good for your ability to play chess immediately afterwards. About two and a half minutes into the three-minute round, Makinen (White) is sent to the ground by a fantastic left hook from Cohen, and it’s several seconds before he recovers and manages to finish the round. You’d expect the dynamic to change from here on out: it’s becoming clearer and clearer that Black is lost on the board, so he must be progressively more aggressive in the ring for a chance at victory. The second round, though, is a little more sluggish. Fighting is difficult, especially for repeated rounds with only short intervals of rest. There remain brief exchanges of blows, as Cohen presses the assault, landing a series of rights. That’s only half-true, however; it would also be entirely accurate to say that Black brought about this result. Cohen had nary twenty seconds remaining on his clock; though you can’t overtly stall in chessboxing, he clearly took more time than was strictly to take the game to a third round. Cohen used his time well: almost immediately, Makinen’s nose was bloodied. After substantial holding, though, with each player exhausted, the game reached its conclusion. Likely, the early blunder upset the competitive balance, but it’s interesting that both sides ended up struggling to hold on in their respective areas. I’d imagine the ideal chessboxing player would be more well-rounded. Let’s see if we’ll get a better match in the next game. So far, it does look like the match is moving in rational fashion, albeit rather slowly: both players are taking their fair share of time. The trend continues in the first round of boxing, which is rather more cagey and methodical; there are fewer frenzied punches. Little emerges with a nosebleed, and does much of the movement. He’s nearly fifty pounds (21 kilos) lighter– If Bjorknas needs to change tactics and press an assault, it’ll be difficult to cope with Little’s mobility. Black, though he received first aid during the game, was bleeding on the chessboard. In the second round, though, he continues to have the upper hand. The announcers discuss Bjorknas’ lack of power despite his strength, and the most damaging punches thrown are a series of Little’s jabs. Though he’ll almost certainly have to win boxing, White wasn’t spurred on by his blunder, and he comes out of the round no better than when he started. The chessboard is cleared from the ring, and Bjorknas doesn’t really have an answer to Little’s strategy. Instead, he’s reduced to following, and produces very little. He hadn’t accumulated much success in the previous boxing round, and this is Bjorknas’ last hope, granted to him by Little’s less-than-clinical play. Indeed, he comes out swinging, approaching more aggressively than before, and lands several damaging clusters of hits. Despite that, though, the final bell sounds, and Little concludes the victory with little fanfare. Following this exchange, however, White summarily defeated Arnott in the ring; despite his worse position, therefore, 1-0. It’s disappointing for perhaps the best chess player on the day to be taken down in boxing, but it speaks to the balance of the sport: a player must have a minimum level of skill in both disciplines. This baseline does address one of the major criticisms of the sport: that Mike Tyson would be the chessboxing world champion. More realistically, Tyson would be checkmated in the first round of chess. There are, though, rather low benchmarks a player must meet. The sport isn’t at the level where it can attract the best players, and, more to the point, the best fans. It’s a fact perhaps best exemplified by the announcer’s comment “Queens move diagonally, as well as up-and-down and side-to-side” halfway through the first game. I can’t speak with any great expertise to the boxing, but the chess, at least, doesn’t have a great deal of substance to it. To what degree is this objectively true, though? Is this empirical, qualitative observation confirmed by what semblance of hard data we can extract from the sport? That’s a question for next time. I’ve recently begun an effort to more deeply analyze the games that I play, and I’m starting small but consistent. 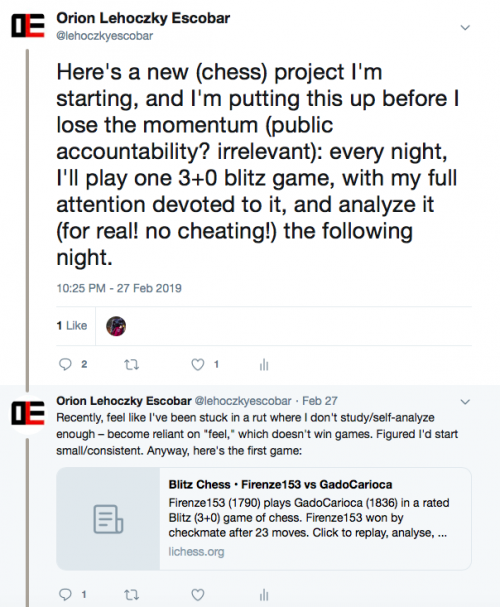 I think the next post should be the last one concerning chessboxing, attempting to think about the wider trends in the sport’s chess games. Best wishes until then. Hey, you're welcome! Glad I could provide some value.